By Niamh Haskins | November 25, 2014. KATIE Taylor has been hailed as Ireland’s greatest athlete after she made history winning her fifth world title in South Korea. The win has put Taylor into the history books as the only fighter along with India’s Mary Kom, who claimed five successive AIBA World Elite titles between 2002 and 2010, to win 5 world titles in a row. The 28-year-old Olympic champion beat Azerbaijan’s Yana Allekseeva to claim her fifth AIBA World Elite gold medal in a row. Going into the bout the Bray native was carrying a minor injury in which she will have an X-ray when she returns to Ireland. This meant that Taylor couldn’t use her jab as she normally would so she had to be more precise in her combinations. 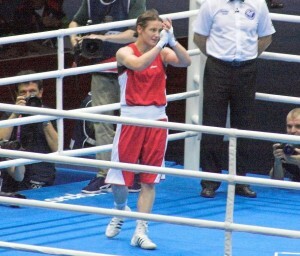 In the first round Taylor was in control as the more aggressive fighter, however, not all judges saw it her way, with one of the three awarding the Azerbaijani the round. In the second round, again Taylor was more dominant pushing Allekseeva into the corners unloading her combinations. In the third round the judges split the decision of 2-1 in favour of Taylor. This leaving Allekseeva needing a knock-out in the fourth and final round to claim victory. The final round was more of a standoff with both boxers single point scoring. The referee intervened and again Taylor began to fight more aggressively landing body shots. Judges scored the Jeju bout 40-36, 39-37, 39-37 to Taylor. Taylor said, “It was a tough fight. It’s an absolute privilege to equal Mary Kom’s record. She was a hero of the sport”. “Allekseeva was very, very tricky. All the top opponents are very tricky at this level. “You can’t rush in, you have to be patient. It was a great contest, a great boxing match and a great advertisement for women’s boxing”. President Michael D Higgins praised the Olympic and world champion achieving so many world titles and for aspiring Irish athletes to follow for generations.